In this post at first we will work on the expression of Acceleration due to gravity or gravitational acceleration (g) on the earth’s surface. We will take help of Newton’s Law of Gravitation as well as Newton’s second Law of Motion. Then we will explore how height or depth from the surface of the earth influence the value of acceleration due to gravity. So let’s find out the expressions for g on the earth surface first. These expressions will help us to find out the variation of acceleration due to gravity with height and variation of acceleration due to gravity with depth. We have added a few Numerical Problems as well at the end of this post. Now you will be able to answer this common query- What is the value of acceleration due to gravity at the centre of earth? Definition: Acceleration due to gravity of an object is its rate of change of velocity due to the sole effect of the earth’s gravitational pull or gravity on that object that directs towards the centre of the earth. and M here is the total mass of earth concentrated at its centre. G is the gravitational constant. Just to recapitulate, as a body falls downwards it is continuously acted upon by a force of gravity. The body thus possesses an acceleration, called Acceleration Due to gravity(g). 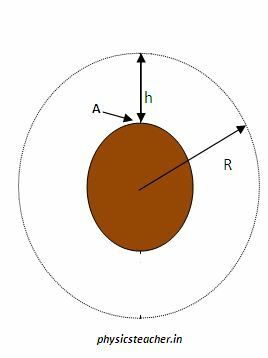 In the next 2 sections, we will discuss how this g varies as we go (a)higher from the surface and go (b) deeper from the surface. In the next section we will see how g varies with depth below the surface of the earth. Let’s say, a body of mass m is resting at point A , where A is at a depth of h from the earth’s surface. Here p is the density. g2/g = [G. (4/3). Pi. (R-h). p ] / [(4/3) Pi R p G] = (R-h) / R = 1 – h/R. So as depth h increases, the value of acceleration due to gravity falls. In the next paragraph we will compare these 2 equations to get a clearer picture. 1) Now from eqn 6 and 8 we see that both g1 and g2 are less than g on the earth’s surface. 1) value of acceleration due to gravity falls as we go higher or go deeper. 2) But it falls more when we go higher. What is the value of acceleration due to gravity at the centre of earth? At the centre of the earth, depth from the earth’s surface is equal to the radius of the earth. So h = R for the equation 8 above. So we can see, the value of acceleration due to gravity at the centre of the earth equals zero. Q1: What is the value of acceleration due to gravity at a height 4 miles above the earth’s surface? Diameter of the earth is 8000 miles. g at the surface of the earth = 9.8 m/s^2.